Find all how-to-guides and step by step videos below. How often does this happen? In the morning, you remember to get milk at the grocery store and then in the evening you forget to do it. 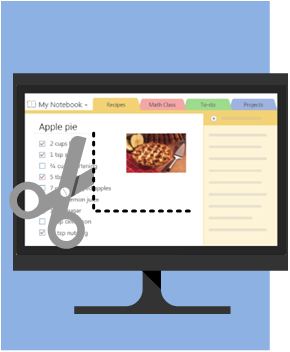 Quick notes are perfect for capturing a thought on one device, such as your desktop when you’re at work, and then retrieving it from another device, such has your phone when you’re shopping. 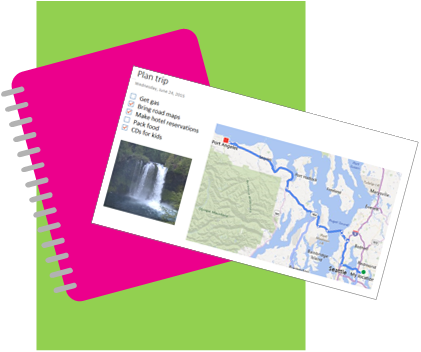 Use Quick Notes to jot down any thoughts and ideas, just like sticky notes. 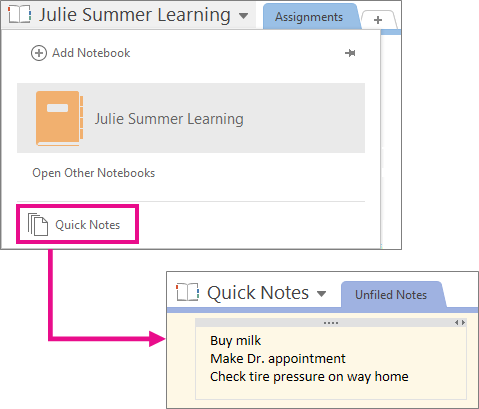 Each Quick Note is instantly saved as a page in the Unfiled Notes section of the Quick Notes notebook. Press Windows+N. 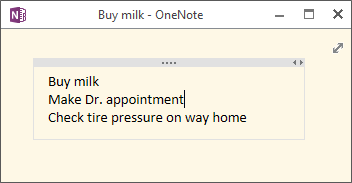 This command works whether or not OneNote is open on your computer. TIP: If you have problems creating a Quick Note, click File > Options > Display, and then make sure Place OneNote icon in the notification area of the taskbar is selected. 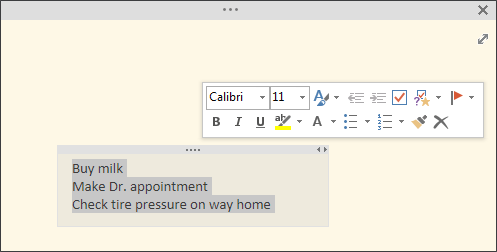 Type your note in the small, Quick Note window. To view the mini toolbar, select the text. To view the ribbon, click … at the top of the Quick Note window. To pin a Quick Note to your screen, in the ribbon, choose View > Always on Top. To enlarge the small window, click Full Page View to enlarge. By default, the Quick Note is instantly saved as a page in the Unfiled Notes section of the Quick Notes notebook located at the bottom of the list of all your Notebooks. You can leave it there or move it another notebook later on. 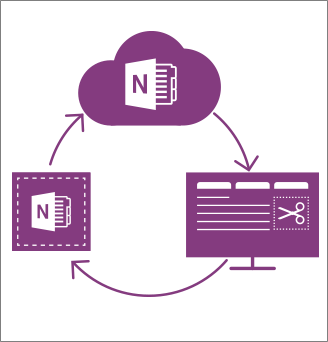 OneNote Clipper is an app that makes it easy to clip from the web and is available on all major browsers. 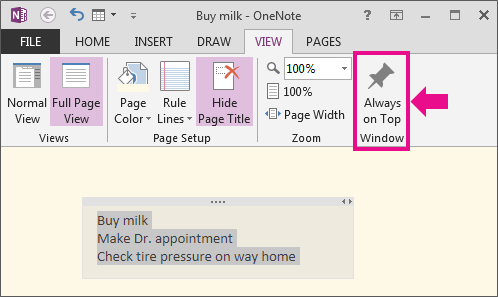 Clip products you want to buy, important news articles, blog posts of interest, tantalizing recipes, research and data for homework or reports — anything on the web you want to capture and put into OneNote. To capture just a portion of the screen, press WINDOWS+SHIFT+S. For more information, see Capture the screen. 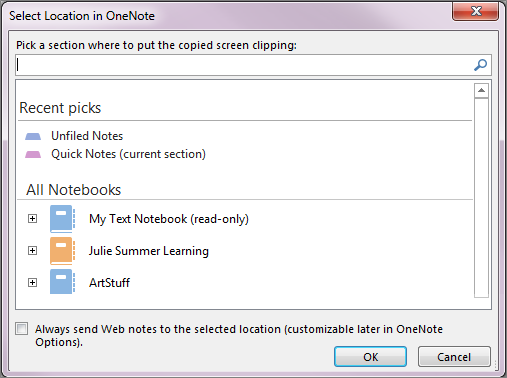 NOTE: The steps to using OneNote Clipper are different on each browser. To install OneNote Clipper on other browsers besides Internet Explorer, open the other browser, and then go to OneNote Clipper. To use OneNote Clipper from the Windows 10 Edge browser, click More actions …, and then choose Open in Internet Explorer. In Internet Explorer, right click on the browser page and choose Send to OneNote. To quickly send the page to the default location, the Quick Notes notebook, and then click OK.
To choose a different notebook or section, under Recent Picks or All Notebooks select what you want. OneNote Clipper extracts text from the web page, and in some cases reformats pages that include articles, recipes, and products. All clips include a link back to the original web site located at the bottom of the OneNote page. Use OneNote to record meetings, conference calls, classes, interviews, focus groups, brainstorm sessions, personal journals, and anything else you don’t want to forget. Even better, any notes you type while recording are synchronized to the audio. Can’t remember exactly what the instructor or presenter said? Just go to the note and listen again. On the ribbon, choose Insert > Record Audio. OneNote adds a recording icon with a timestamp and starts recording. 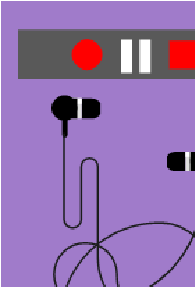 Use the Audio ribbon to manage the recording. TIP: Don’t forget to stop the recording when you’re done. Otherwise, you can’t record another audio. Throughout the day you see lots of information you might put into OneNote. You can collect clippings, maps, diagrams, photos, pictures of products for purchase, and so on. To do so, either capture the screen with shortcut keys or clip the screen with the Send To OneNote command. To capture the entire screen, press PRTSCN. NOTE: On some keyboards, the PRTSCN key might appear differently. To capture an active window, press ALT+PRTSCN. 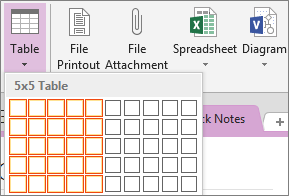 Go to In OneNote, and then to paste the image, press CTRL+V. NOTE: Some devices lack a Print Screen key. Check the manual that came with your device for specific instructions. Drag to select the portion of the screen. Click a location in the Select Location in OneNote dialog box. Insert screen clippings, camera photos, scanned images, cell phone photos, maps, and any other kinds of images into your notes. To start a screen capture, choose Screen Clipping (press Windows+S). To insert a picture from your computer or network, choose Pictures (press ALT+N, P). To insert a picture from Bing, the cloud, or the Web, choose Online Pictures (press ALT+N, L). 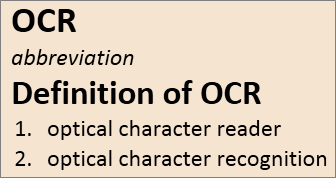 OneNote can read text in an image by using a feature called Optical Character Recognition (OCR). This means you can copy text from an image and paste it where you need it, which can be a real time-saver. 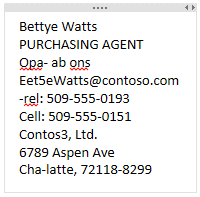 Behind the scenes, OneNote also uses this nifty OCR feature when searching your notes. 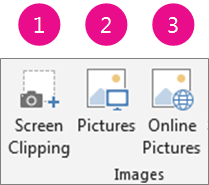 From a OneNote page, right-click a picture that has text, and then choose Copy Text from Picture. Choose where you want to copy the text, and then press CTRL+V to paste it. NOTE: Clarity of the text, character spacing, and other issues can affect the quality. Final editing and fix-up is sometimes required. 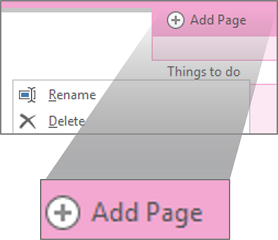 You don’t have to insert everything into OneNote. 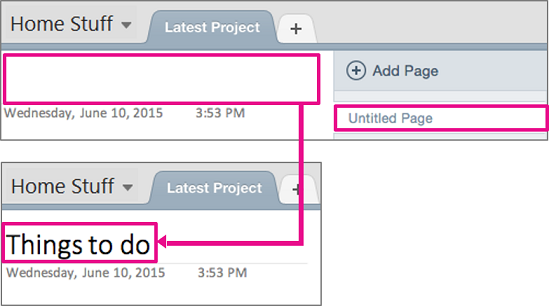 By adding links to related content, you can quickly get to a Web page or document that’s relevant to your notes. Linking is preferred when you know the Web page or document might be updated and you always want the latest version. Select the text or picture you want to link. Choose Insert > Link. (Press CTRL+K)If you selected text, it appears in the Text to display box. In the Address box, type the link, or choose the buttons to browse the web or locate a file. Right-click the link text or image, and then choose Edit Link. 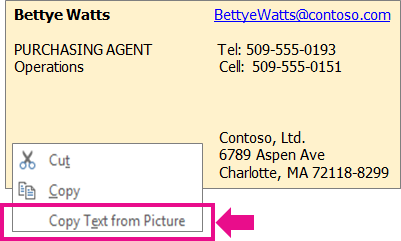 Edit the Text to display or Address box, and then choose OK. Tables are a great way to organize information in your notes pages. Start by typing and using the Tab and Enter keys. Or, draw a simple grid. Then if you want, make more sophisticated tables with headers, borders, and shading. The easiest way to start a table is to press the Tab key. Type text in the new column. To create another column, press the Tab key, and type text. To create new a row, press Enter in the last cell. To finish, press Enter in the first cell of the last row. Create the table above by using the Tab and Enter keys. Move the mouse pointer over the grid to choose the table size, and then click. Use the table ribbon to modify the size, borders, and colors of the table. 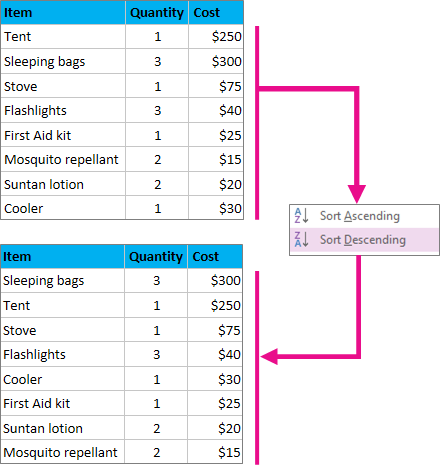 Sorting a table column gives you ways to organize your table data just the way you want. Position the insertion point in the column you want to sort. To toggle a Header row on or off, Choose Layout > Sort and then choose Header Row.If the first row is treated as a Table header, it is not sorted. Otherwise, it is sorted with the other rows. To sort from A-Z or 1 to 9, choose Sort Ascending. To sort from Z-A or 9 to 1, choose Sort Descending. To sort only certain rows, select the rows, and then choose Sort Selected Rows. 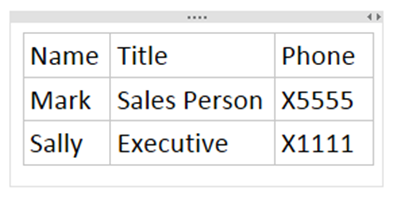 If a table gets too large or complex, take advantage of all that Excel has to offer. 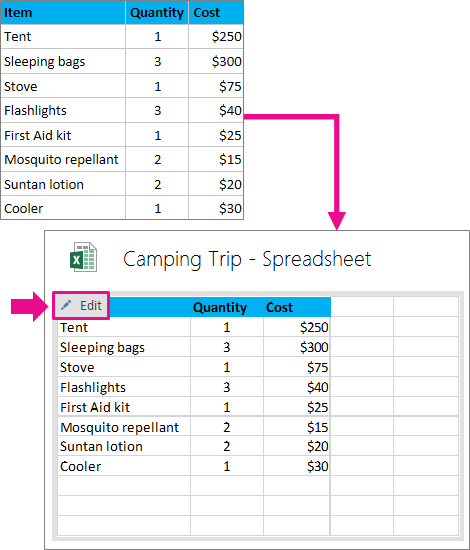 Click the table and then choose Layout > Convert to Excel Spreadsheet. An embedded Excel spreadsheet appears. To open in Excel, click Edit. 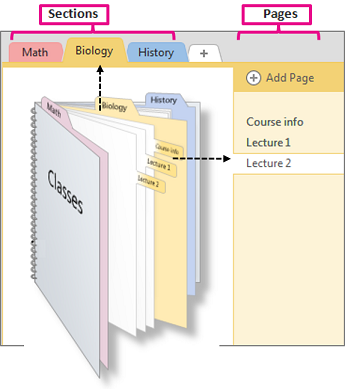 A OneNote notebook is organized into sections and pages, and it’s easy to make them colorful. Like most notebooks, it fills up over time. But here are some amazing facts. A OneNote notebook never runs out of pages, the pages never run out of space, and you can add as many sections as you want. When you create a notebook, it creates a default section for you. 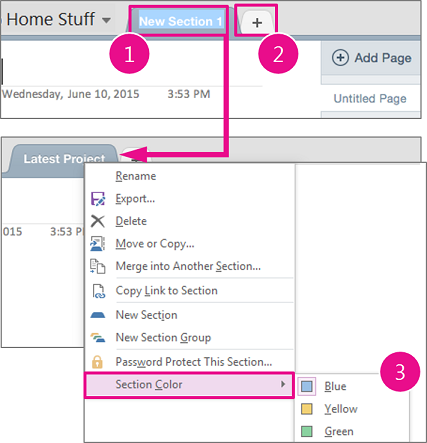 To rename a section, double-click New Section 1, type a name, and then press Enter. To create another section, choose the Plus Sign (+). 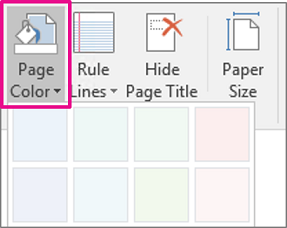 To change the color, right-click the Section tab, choose Section Color, and then choose a color. When you create a page, a blank page header is added. To rename the page header, type a title and press Enter. To rename a page, right-click the Page tab, choose Rename, and type a name. To add a page, choose + Add Page. To change the page color, choose View > Page Color, and choose a color. You remember when you put stickers and sketches on your sixth grade notebook. After all, it was your notebook. In OneNote, you can apply templates to fit your personality, style, and frame of mind. Choose Insert > Page Templates. In the Templates task pane, expand the categories. To apply a template, click its name in the list. Press CTRL+Z if you don’t want it. Repeat until you find one you prefer. TIP: You can’t add a template to a page with notes. But, you can add a new page, add a template, and then copy notes to the new page.